Jeff and Steve talk more about some of their top TRX moves for getting you in the best shape this summer. Video #4 in our series is all about how suspension and body weight training can up the stakes when it comes to your fitness routine and goals. "Mobility + Stability + Strength = Durability"
Need more guidance? 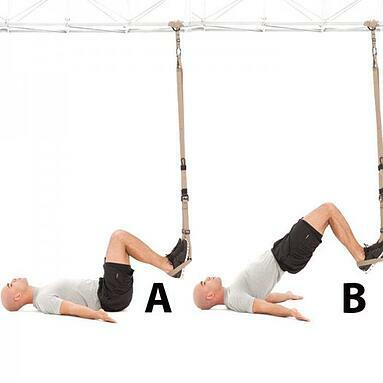 Try these 4 TRX moves in your next workout! “This full-body exercise is one of my favorites as it focuses on strength and stability of the abdominal muscles, hip flexors and shoulder girdle,” shares Tiffani Bachus, personal trainer, registered dietitian and fitness magazine cover model. A. Place feet into foot cradles so tops of feet face the floor. Position hands below the shoulders and press up into a plank position. B. Keeping core engaged, bend knees and hips to torso, allowing the hips to lift and spine to flex. With control, slowly return to starting position. “This exercise engages your entire body, from your toes to your nose. 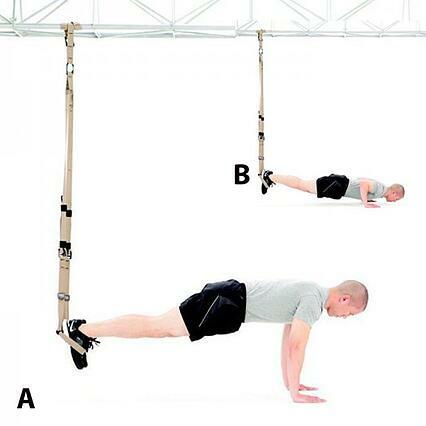 Plus it delivers a huge core and upper-body workout,” says Randy Hetrick, Founder and CEO of TRX. A. With straps position at mid-calf, place feet into cradles and press up into plank position, aligning hands below shoulders. B. While maintaining a solid core, lower chest just above the ground bending the elbows, then push back up to starting position. “Many people make the mistake of only focusing on what they can see in the mirror, however this exercise challenges the core while also strengthening the backside of your body,” says Chris Frankel, director of programming for TRX. A. Lie on your back with heels in foot cradles and knees bent 90 degrees. B. Drive heels into the foot cradles and lift hips until knees, hips and shoulders are all in line. Return to starting position by lowering hips with control, keeping knees over hips. “This move looks simple but it strengthens all of your pulling muscles plus core muscles that control rotation,” shares Fraser Quelch, head of training for TRX. A. With the TRX adjusted to mid-length, stand facing the suspension trainer grasping one handle with left hand next to your chest. B. In a circular motion, rotate your right arm toward the ground and extend left arm, keeping hips squared. 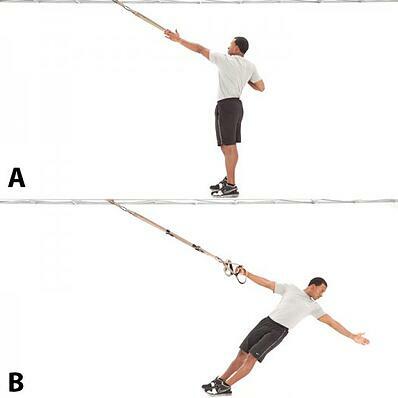 Pull yourself up with your left arm while rotating back toward the TRX until your right hand is touching the suspension trainer.